Countless times now, very talented, intelligent, and wonderful people have asked us if they are doing something wrong because they have been ‘waking up’ for a while, but still feel so lost, confused, and frustrated in many areas of their lives. The truth is that waking up to consciousness– while still living in this 3D world– inevitably involves feelings of sadness, anger, disappointment, and/or being overwhelmed. After all, if when “your veil lifted” you woke up to a perfect, joyous, peaceful, and welcoming world, you and other light workers probably wouldn’t need to be on this planet right now to help initiate change around you! So, take heart. 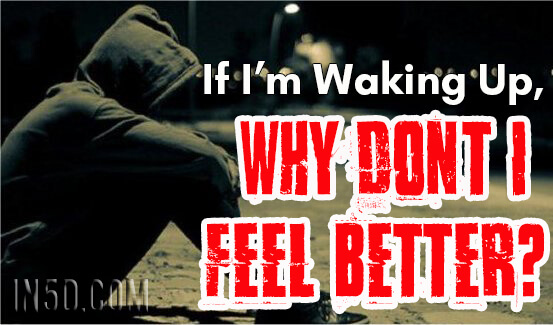 If you have moments or even phases and stages of feeling downright miserable, you are most likely on the right track and “waking up” quite effectively and successfully. Your more permanent upswing is not far away, though it can seem discouragingly temporary or, at times, even untouchable. Being a light worker today means being a pioneer—one who can envision the beautiful possibilities for the human species and for our world, but who has the daunting, uncharted task of paving the way. Today’s light workers are also like “sleeper cells” positioned and waiting for information, and who are often left with an incomplete picture until the last moment or as absolutely needed. The unfinished or unclear information can make these “special forces” feel like they have taken a wrong turn or aren’t “worthy” of more clues or direction from their higher consciousness, from guides, or from other Divine energies. Friends, relatives, co-workers, and the community at large can’t seem to handle your truths or perspectives. You have often created a captivating facade in order to hide or blend, or have had to gradually “plant seeds” with others rather than reveal or share more so as not to be criticized, ostracized, or denied certain opportunities. As a result, relationships can feel lonely and not genuine. You may find that life-long connections have faded away and that you yearn for THE ONE or ones who truly “get it” and get you. You recognize the greed, misinformation, disinformation, and/or propaganda in the government, health care industry, financial systems, organized religions, and even in a lot of the metaphysical world. It upsets you that the public is still being so controlled and lied to, and that most cannot see through the veil of deception. Your work or career does not seem fulfilling. You feel that you are not “serving others” enough, either because of the industry in which you work or because the public is not ready to receive to your help, talents, and messages. You have gone through and survived so much in life, but still aren’t sure of the details regarding your mission as a light worker in this world. You feel almost lost at sea without land in sight. The “signs” and messages from your guides, nature, and/or the Universe often appear more vague, unclear, mundane, and/or less frequent than you would like or than you experienced in other periods of your life. You are discouraged by the “glass ceilings” you have encountered in many areas (health, relationships, finances, etc.). You wonder if they will ever be lifted so that you can truly feel and share the magnitude of your light and power. If you find that these sentiments resonate with you, you are not alone and you are not crazy. Unfortunately, less than 1% of the world’s population is well on its way to awakening to consciousness. The rest are making strides, but much like children or adolescents before a growth spurt, they still have some growing and evolving to do in order to be more heart-centered; to be more concerned about others and the environment; and to succeed at integrating these values into our 3D existence– which will likely continue for many decades to come. The seemingly daunting task at hand for light workers is NOT to aim for ascension as a means of escaping, but to bring ascended ways to our 3D world here, now, and in the near future. Your trials, tribulations, and challenges have given you the tools or reference library to assist others with unique honesty and sincerity, especially when they go through their own awakening, clearing, and lessons in the coming years. Your glass ceilings will necessarily be lifted so that you can be the beacon and shining example of how to survive and thrive– despite challenges and hardships like the ones you have experienced. Crystal Children, twin flame relationships, and other deep soul connections are happening in greater numbers and faster than ever to help connect, unite, and empower light workers worldwide. Recent, record-breaking solar flares, alignments, storms, earthquakes, and other unusual natural/cosmic events have been wreaking havoc on our technologies, grids—and light worker’s sensitive bodies. Although unprecedented events will continue, light workers should find that their systems are more insulated and not as prone to the weight gain, thyroid issues, depression, fatigue, and other maladies associated with “taking in” those cosmic disruptions. Mass consciousness and its attitudes, perspectives, and frequencies have weighed heavily on light workers—causing new or residual fear, anger, despair, and even stagnation, paralysis, or very delayed manifestations. As we move forward in the coming months and years, mass consciousness will also begin to shift in response to natural events, political changes, faltering economies, and a general “waking up” in the population. That opening and/or awakening may not be easy for a majority of the public, but it will offer hope, energy, and momentum to the light workers who assist with the process. A greater number of light workers will realize that the more awake they become, the less “phenomenal” their cosmic experiences need to be. Astral travel, signs, messages, premonitions, and discernment are naturally activated—not experiences that can be learned or copied—and are things that can be seen and appreciated in simple, everyday occurrences like songs, coincidences, shadows in the peripheral vision, buzzing in the ear, and moments of time in which you “just blank out” but know that you have been in another dimension. As you awaken to consciousness, the energetic experiences may seem less dramatic or colorful, but the downloading of information is more profound and plentiful. Although light workers will continue to be “supercharged” humans who feel the intense highs, lows, and passions of being human, they will find in the coming months and years that the audience around them is finally listening and more ready for their truths. During this time, light workers will be “allowed:” to enjoy more of the fruits of the seeds they have been planting; to access more conclusive information regarding their personal missions and journey; as well as to delight in the actualization and manifestation of goals that have seemed so elusive for far too long. The upswing for light workers is a dream-come-true, but also a cosmic necessity and inevitability– in order to help move this planet into a more conscious state of living. So, light worker pioneers, please keep moving forward and hanging in there. Your important energies and love are lighting the way! Tags: advice, awakening, awakening to consciousness, consciousness, cosmic experiences, Crystal Children, divine energies, guides, higher consciousness, If I’m Waking Up, light workers, lightworkers, Max and Lana, relationships, soul connections, tips, twin flame, twin flame relationships, waking up, Why Don’t I Feel… Better?